If you find yourself troubled with patios, decks and walkways covered in debris and fallen leaves you need a handheld blower. A handheld blower will cut your job in half. The only thing you can do is determine which blower is best for your needs. A small blower wont be powerful enough to clear debris from hard to reach areas. When you need more power for an extended amount of time you should consider buying the Husqvarna 125B gas powered hand blower. The Husqvarna 125B is an outstanding blower if you are looking for a way to get rid of debris and fallen leaves. It produces enough air pressure to clear debris from all surfaces. No matte how much debris you have to clear the Husqvarna 125B will get the job done. 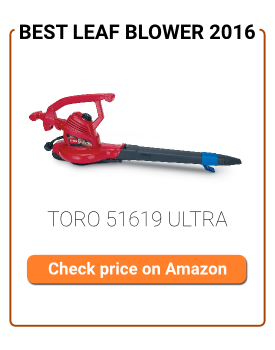 It is a solid performing leaf blower that is perfect for any job. You won’t be disappointed with its performance. This leaf blower is easy to hold, it is not a strain on your arm or wrist to carry.It is extremely easy to handle. It only weighs 9.4 pounds so it isn’t excessively heavy.It has a variable fan speed with an adjustable blowing tube. It has a powerful blower with 28cc of engine and it is capable of generating 1.4 hp. It can achieve speed up to 8000 rpm. It is a gas powered blower that has a fuel tank of 16.91 fl oz. The fuel consumption is decent. It has an auto return stop feature. The Husqvarna 125B is known to have difficulty starting. They are also known to have problems with the fuel lines. The Husqvarna 125B requires a mixtures of oil and gas. You have to use this mixture every time otherwise you will have problems. The Husqvarna 125B is not the most comfortable leaf blower to use. Its handheld design makes it more cumbersome than backpack style blowers. If you are using this model for hours on end you will develop wrist fatigue. You may even develop shoulder pain. Some users have also noted that this model leaks fuel from the cap. The Husqvarna 125B is a really good handheld blower for household use. It has a state of the art 28cc engine that makes it possible for you to get top notch perfomance throughout whatever task you are using it for. If you are looking for an efficient blower its state of the art design makes it the ideal choice for you. It has an air speed of 170 mph and an air volume of 425CFM So you can clear any surface with ease. That being said, despite thus being a powerful blower it does not act as a vacuum like some other blower models do. If you want your blower to double as a vacuum you will have to look at other models. Though some people receive defective models when buying the Husqvarna 125B. Those who received models in good working order praise the models reliability and its longevity.